Pamphlet entitled "Newark's Historic House of Prayer"
Pamphlet entitled "Let Us Save the House of Prayer"
The House of Prayer had its beginning in 1847. At this time services were held in a stone schoolhouse by Rev. E. J. W. Roberts. An option to purchase the Plume property was secured and in 1849 it was purchased under the guidance of Rev. Samuel L. Southward. Meetings were held in the homestead on the property. The actual organization of the church was on November 24, 1849. 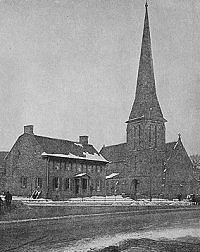 The cornerstone of the new church was laid on November 28, 1849 and the opening was on November 26, 1850. The cost was only $23,000 including the gargoyles and spire. A fire occurred in the church on November 10, 1851 but little damage was done. In 1861 a brick parochial school was built on State Street. In 1866 the old cracked bell was sold and the proceeds went into a fund to purchase and organ from the Hall & Lebaugh company which cost $2,432.10. This was purchased in 1870 and rung first on Easter Day. One of the Reverends, Hannibal Goodwin, invented the celluloid roll films for cameras. After years of patient toil in a little laboratory in the rectory of the church, he perfected his discovery in 1887. Many years of heartbreaking struggle for a patent followed. It wasn't until 1914, 12 years after his death, that his right to the invention was fully and finally established. Today the Plume house still stands but is badly in need of repairs. The Newark Preservation & Landmarks Committee held its first meeting in the house in 1973. A photo of the house in a mason jar serves as a logo for the committee. Sisterhood of St. Margaret works in the Parish. Has a mission next to the Rectory. Church assists its own destitute members and does a general work in neighborhood and in Kearny. Strong branch of the Girls' Friendly Society.